A new form of nonvolatile MRAM memory with the promise to eventually replace DRAM is slowly making its way into products, but analysts said it could be a long time before DRAM technology is cast aside. Everspin on Wednesday said its MRAM (magnetoresistive random access memory) is trickling into products that require reliable, fast non-volatile memory that can preserve data in the event of a power failure. MRAM has been under development for decades, and Toshiba and Hynix last year committed to developing the new memory type to ultimately replace DRAM and NAND flash. MRAM operates just like standard memory, but uses magnetic properties to store data instead of storing a charge on a capacitor as with DRAM. But analysts said the prohibitive cost and limited density will restrict MRAM to specialized markets in the short term. Everspin's MRAM products are being used in storage and networking products from Dell, which was looking for a fast, reliable non-volatile memory to preserve data in case of a power failure, said Phill LoPresti, CEO of Everspin. The memory is also being used in BMW racing cars, Airbus A350 flight control computers and Siemens' industrial automation systems. "There is a comfort level building, and an ecosystem has to be evolved around it, and we're working on it," LoPresti said, adding that Everspin was the only company shipping MRAM products. MRAM is a viable replacement for some networking and storage products in which density isn't a primary concern, said Mike Howard, senior principal analyst at IHS iSuppli. 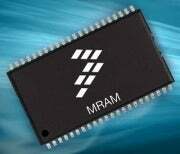 For example, MRAM is being used as an alternative to non-volatile SRAM in Dell's products. MRAM is currently shipping in small volumes and will likely gain acceptance only after DRAM hits a wall, Howard said. A lot of money is being spent in the development of DRAM, which also has a price advantage. MRAM has promise as a memory technology as it can scale down more effectively than DRAM and NAND flash, said Jim Handy, analyst at Objective Analysis. DRAM, and to a great extent NAND flash, has a scaling limit because as the chip geometry decreases, there's less room, which means fewer electrons in an area, Handy said. MRAM is "more shrinkable as it doesn't count on the number of electrons trapped in an area," Handy said. There are other memory types such as phase-change memory (PCM), which is backed by Samsung and Micron, contending to replace DRAM and NAND flash. But if MRAM is to replace DRAM, it will be at the end of this decade, Handy said. Recognizing that it usually takes time for a new memory type to crack the market, Everspin is keeping its initial MRAM focus on enterprises. The company is also targeting the use of MRAM as memory in solid-state drives, LoPresti said. "We help NAND work better" by providing another caching layer, LoPresti said. The company claims it has more than 300 active customers and secured 250 design wins last year for its MRAM products.